Site of the bloodiest fighting during the first day of the Revolutionary War, April 19, 1775. A friendly, moderate traffic e-mail forum for anyone who loves Arlington. 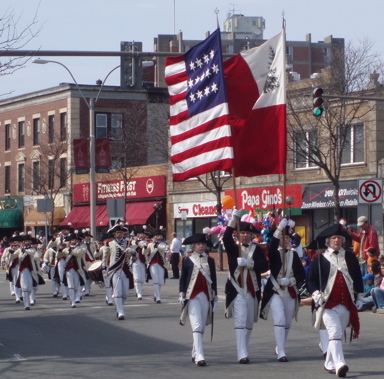 Bienvenue vers Arlington historique, le Massachusetts. Site du combat le plus sanglant pendant le premier jour de la guerre rŽvolutionnaire, avril 19, 1775. Willkommen nach historischen Arlington, Massachusetts. Site des blutigsten KŠmpfens wŠhrend des ersten Tages des revolutionŠren Krieges, April 19, 1775. Benvenuto a Arlington storico, Massachusetts. Luogo della lotta pi� sanguinante durante il primo giorno della guerra rivoluzionaria, 19 aprile 1775. Boa vinda a Arlington historic, Massachusetts. Local da luta a mais sangrenta durante o primeiro dia da guerra revolucion‡ria, abril 19, 1775. Bienvenido al histórico Arlington, Massachusetts. Sitio de la más sangrienta lucha durante el primer día de la guerra revolucionaria, el 19 de abril de 1775. Including the beautiful art of Adria Arch. Including photos along Massachusetts Ave.
for the Arlington online community. and restaurant listings at Arlington Bites. Old Bile building & Peirce School demolition. Extend the Red and Green Lines! for anyone who loves Arlington. © 2014, Paul Schlichtman, webmaster. and pages linked to this site, is par for the course. This is a community website open to diverse views.